The Breakdown: Is Offshore Drilling Ever Safe? Is BP unique in its ability to create catastrophe? On this week's episode of The Breakdown, Chris Hayes asks Greenpeace's Kert Davies whether the entire practice of offshore oil drilling is inherently dangerous, regardless of which company runs the rig. At a congressional hearing on Thursday, politicians criticized BP chief executive Tony Hayward for his company's lax safety practices and the oversights that led to the Deepwater Horizon blowout. Meanwhile, President Obama vowed to "make BP pay" for the oil spill and, yes, tens of thousands of barrels of oil continue to pour into the Gulf of Mexico each day. Is BP unique in its ability to create catastrophe or is the entire practice of offshore oil drilling inherently and equally dangerous regardless of which company is running the rig? 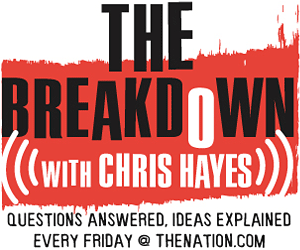 The Nation's DC Editor Christopher Hayes and Kert Davies, research director for Greenpeace, answer that question on this week's edition of The Breakdown. At a congressional hearing on Thursday, politicians criticized BP chief executive Tony Hayward for his company’s lax safety practices and the oversights that led to the Deepwater Horizon blowout. Meanwhile, President Obama vowed to “make BP pay” for the oil spill and, yes, tens of thousands of barrels of oil continue to pour into the Gulf of Mexico each day. Is BP unique in its ability to create catastrophe or is the entire practice of offshore oil drilling inherently and equally dangerous regardless of which company is running the rig? The Nation‘s DC Editor Christopher Hayes and Kert Davies, research director for Greenpeace, answer that question on this week’s edition of The Breakdown. Davies’ recently launched blog, StopGreenwash.org, that calls out corporations that cynically cloak themselves in environmentalism. Rachel Maddow talks with Rep. Ed Markey (D-MA) about safety regulations for the oil industry. Note: This episode of The Breakdown originally aired June 18. New episodes will return September 10.